Moving In With Dementia: Happy Mother's Day? I went to the mall yesterday, which in hind site I realize was a bad idea on the day before Mother's Day. The mall was packed with shoppers, full of sales associates shoving perfume samples at me, big pink signs with roses and fancy script saying "Happy Mother's Day," and tons of sales people. I tried to walk through the mall quickly with my head down, but if I looked at anything, unfortunately, a sales associates would catch my eye and ask: "Are you looking for something for your Mother?" When I would say "Not today" they would reply, "Well, I can help you find something for her" or "Don't forget to get her something before tomorrow." I have never really been bothered by the holiday push. I used to work in retail and I know they only do it because it's their job and the stores focus on the holiday because it makes a lot of money. I tend to be able to ignore it even when a holiday does not feel joyous to me. But this year I had a harder time with the Mother's Day push than usual. I felt angry, sad, and like I could cry right there in Macy's. I really felt like just looking someone straight in they eye and saying "Well, my Mom is confined to her bed, can't move her limbs, dying from dementia. She can not pick anything up to touch it, she does not need new clothes, she won't use new jewelry, her sense of smell is low and she is not really going to use the Joy perfume we would usually chip in to buy her, she rarely talks, can't read, and doesn't open her eyes very often to look at things. So, can you tell me what you might have in the store that I can buy for her?" That would have been really rude, and I never would have done that. However, just thinking it made me realize that last year I would have been able to easily buy my Mom something from the mall. I still would have needed to accommodate for her dementia and Parkinson's but I could have found her something pretty she would have liked. Now it is just not the same. My Mom is still alive yet the ways in which I would have cared for her before, or the things I would have given her previously do not apply. She is not gone, but some things are lost. I did not know of anyone who would really understand what I was going through except my best friend who's mother had died a few years ago. She would be the only one I could ask how to get through Mother's Day, even though my Mom is still alive. My friend would understand what I meant, and she did. She powers through the day like all of us who's mothers are either sick, dead, absent, or even people who have abusive mothers. You just get through the day the best you can and make sure you have people you can call on when you are sad and grieving. Flowers for Mom. Photo by Jeff Norris. I am a firm believer that people with dementia are still here and they can still enjoy things. I try to remember that every day. But that does not mean we do not grieve over the things they can no longer do or miss how we would have interacted with them before they got dementia. Holidays tend to remind us of this grief when the rest of the year we try and ignore it and make the best of the situation we are in. It would be bad ministry for me to say that you do not grieve for your loved one with dementia even when they are still alive. Sadness and grief is part of the process and I truly think it helps us heal and move on to be able to create meaningful time together, rather than getting stuck by trying to deny the illness is there. So, I am sad about Mother's Day and for the parts of Mom that are not here anymore, but we still find ways to celebrate with her, bring joy into her life, and access the part of her that is still here- her soul. My siblings and I will be going to dinner at Mom and Dad's tonight. Mom loves family and good food. Mom also likes beautiful things and color, and while I could get her something like a pretty picture or statue, that would make the house more cluttered, which does not help people with dementia. 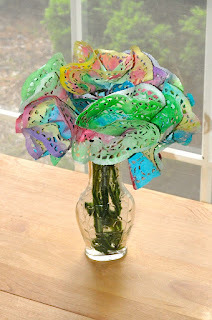 So, my husband, son and I made her some flowers out of watercolors and paper doilies which are made with love, pretty for her to look at, but can be thrown away after a while and do not add to clutter and confusion in the house. Of course though, her favorite gift will be the gift of time we spend with her, which is way better than the perfume, purses, and jewelry at the mall. Katie, I can relate a little bit to your post. Last year, my Mom was in a similar state after stroke. All we could do was to visit her at the Lutheran Home with flowers - a gift she always liked to receive. I held the flowers close to her so that she could smell and touch them. I understand being in a state of grief for a loved one even though she was still here with us. Hugs! Anastacia Adamcik. *hugs* I forgot to post it on the internet, but you and several other friends I knew would be reminded of losses were in my thoughts and heart yesterday. Your gifts (physical and otherwise) to your mother are beautiful, and the legacy she leaves in how you live your life is amazing.